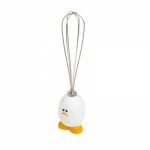 A Whisk for Childs – I have been on the lookout for kids cooking equipment, and I have found several good options for whisks out there. At first I tried out some inexpensive RSVP Mini-Whisks (2 for $5), but while they were definitely child-sized, they seemed smaller than they needed to be. Small isn’t bad, but a common 8 or 9-inch whisk is actually a good size for most kids. 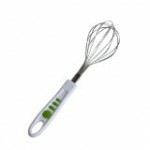 So far my favorite has been the Oxo Good Grips 9-Inch Whisk — and my daughter really likes it too. The handle has a great feel, and it works well with her little hands. 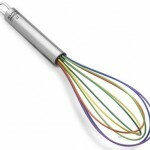 Another good (but more expensive) option is the Kuhn Rikon 8-inch Silicone Rainbow Whisk (above) for around $13. I like the look, and it can also be used on non-stick surfaces. 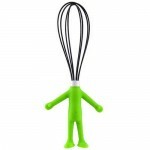 This and the OXO whisk would be a nice combo, and since they are regular cooking utensils, your kids won’t outgrow the style.
. 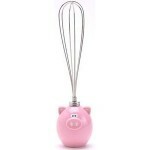 I have seen their egg whisk in stores before, but I like the pink pig version best. 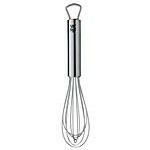 One of the best buys, however, is probably the WMF Profi Plus 8-Inch Whisk for $7. That’s a very good price and WMF is a solid brand. 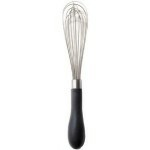 This whisk also comes in an 8-inch silicone version for non-stick pans for around $15. 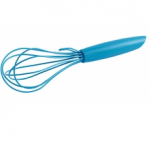 And lastly, Mastrad out of France (Orka in the US) has a silicone mini-whisk for kids. Unfortunately, I can’t find this product for sale in the US, but hopefully it will make its way here in the coming months. 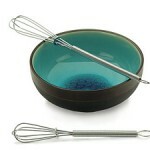 The Mastrad whisks come in a variety of colors and also have a clip so that the whisk can be attached to the bowl edge to prevent it from sliding into the mixture — a nice feature.